You've probably never thought about it but choosing the right needle for sewing the lingerie your about to make is very important. Covered already in a previous post about why your stitches skip - choosing the right needle can equate to beautifully seen lingerie made with ease to, well, not so beautifully sewn lingerie. Let's start with the needle widths: different needles are different widths to use on different weights and types of your fabric. There are two needle sizing systems: the European and the American. The European range from 60 to 120 and the American range from 8 to 20. You will usually see both sizes on the packet. Basically the larger the number the larger the blade of the needle will be and the heavier the fabric you can sew. Universal needles: These have a slightly rounded tip, and I use this for general purpose sewing for wovens as well as some sturdy knits. Jersey needles: These have a medium ballpoint tip, and I would use these for knit fabrics. The needle slips between the knit fibres and does not break or damage the fabric while sewing. Stretch needles: These often confused with Jersey needles, they also have a medium ballpoint tip, but these have a special eye (the hole in which you thread the needle) and scarf (the indentation on the back of the needle - which allows the bobbin hook to grab the thread when it goes under the plate of the machine to create a stitch). These needles are designed for extremely stretchy fabrics and elastic, so applying elastic to lycra etc. It would be this needle that I would use the most. - 8/60, 9/65, 10/70 use on very fine fabrics such as fine silk, chiffon and fine lace. - 11/75, 12/80 use on light weight fabrics such as cotton voile, silk and lycra. Also remember to change your needle often, the average needle lasts roughly 6-8 hours of sewing use. 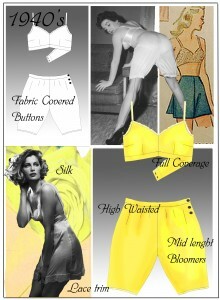 This image features in the new book (that will be out shortly) "How to spec and grade lingerie". It shows you the importance of after a fit, knowing and understanding your fabrics and patterns. The briefs were made after an actual fit session with a client who wanted to increase the depth and widen the gusset at the front mid leg. The brief on the left was altered by a pattern maker, one look though, you will see it doesn't look right. The one on the right is the pattern altered by myself after stopping the alterations going further, where I would have increase it. Both briefs technically do the same job, they got increased by the amount the buyer wanted. However by understanding that the satin on the front didn't stretch horizontally I was able to make the call of adding in the front and the back to allow a nice curve of the front leg. If after your fits your lingerie is still looking wrong, start again, and add the measurements in differently to create the look and fit you wanted. With time you will be able to do this quickly. The book went live yesterday to buy as an ebook from Amazon. It'll be a couple of weeks yet before it's out of hardback. Aimed at helping understand the technicalities of a bra, the book is written from the perspective within the industry, to help people understand the difference between different shape cups and how your bra size is determined. It also goes into a detailed breakdown of the bra and includes a list of international websites where you can buy lingerie materials and components. Having designed for over thirteen years I know how daunting and confusing it can be to understand the technicalities of how a bra works, so I asked established Lingerie Designers the following question. You may just be surprised by their answers.